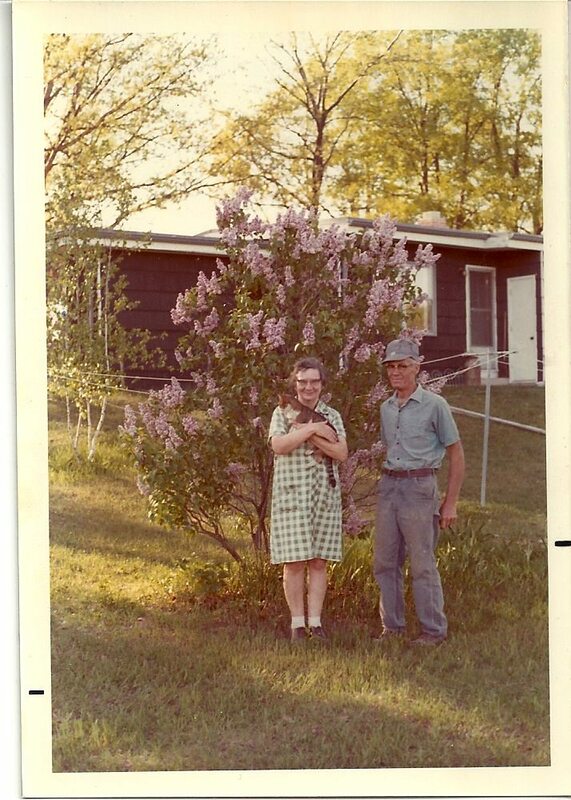 Grandma Dora and Grandpa in the back yard of the “brown house” down the road from their farm house. Family get togethers often pop up during the summer. We had one coming up, with my husband’s, mother’s side of the family. Hamburgers were on the menu for the main dish. Everyone was asked to bring a side of some kind to go along with it. Now, being the mulit-tasker that I am, I decided it would be in my best interest to use one of my Grandma Dora’s recipes. That way I’d be getting my side dish and a blog entry ready at the same time. So, I pulled out the recipe for Peach Whip. Fruit salads, are such a “picnicky,” potluck food and it seemed appropriate. I also thought (which was the real reason I picked it) that it seemed like it wouldn’t require a lot of effort, which was good, since I was in a pinch for time. Mix boiling water and lemon jello packet until dissolved. Set aside. Drain peach juice from can and add water until you have 1 cup. Add to jello. Mash peaches and mix them into jello mixture. Fold in Cool Whip. Chill in the refrigerator overnight or until set. Stir before serving. 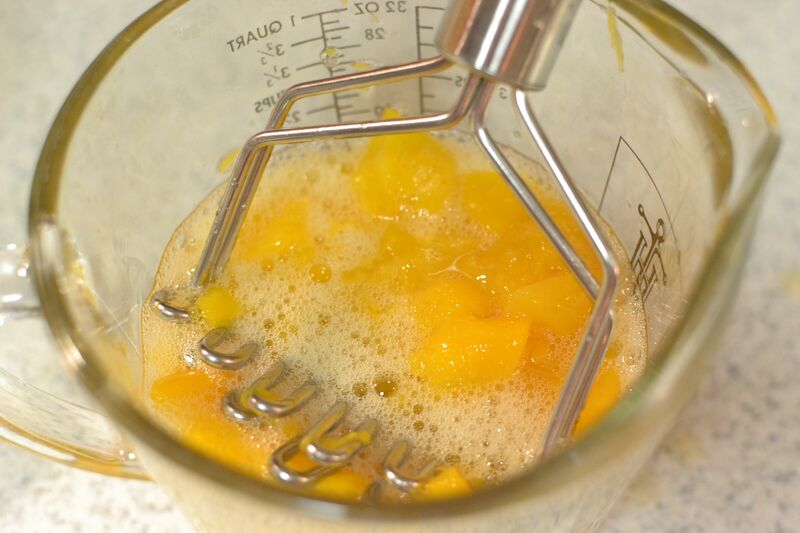 Then I mashed the peaches. 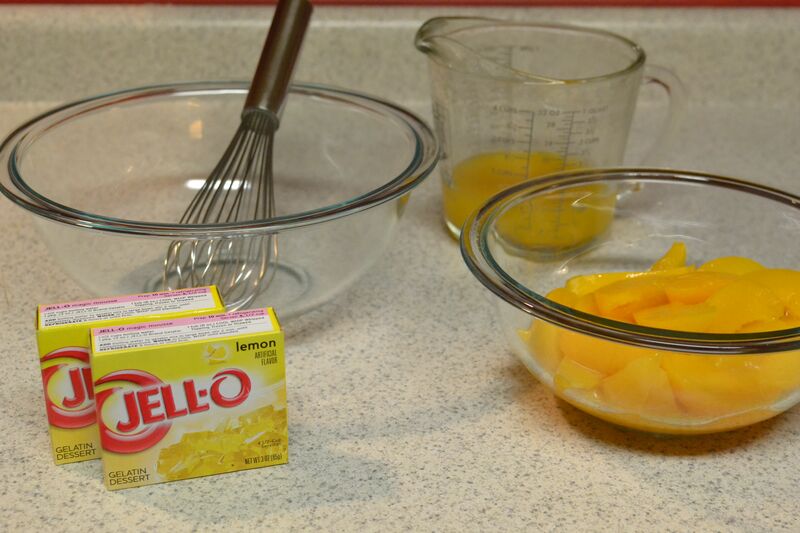 After the water had boiled, I measured out a cup and stirred in a box of the jello until it dissolved. I added a cup of peach juice and the mashed peaches. Then I stirred in the Cool Whip and put it in the fridge to set until morning. In the morning, I mixed up the Peach Whip and packed it into the cooler to take to the reunion. It was served along side of the dessert, for those who didn’t want cake. It was a light, fluffy salad. 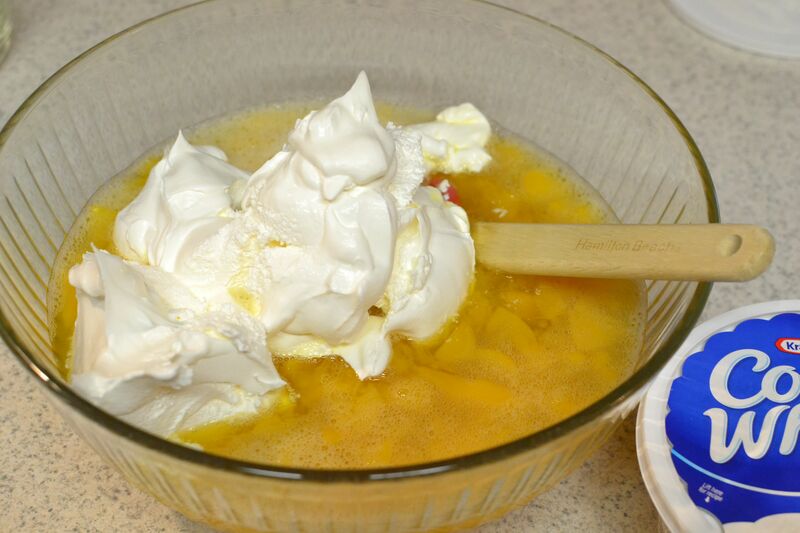 The lemon jello gave it just the right amount of tartness, but it was also sweet because of the peaches and Cool Whip. 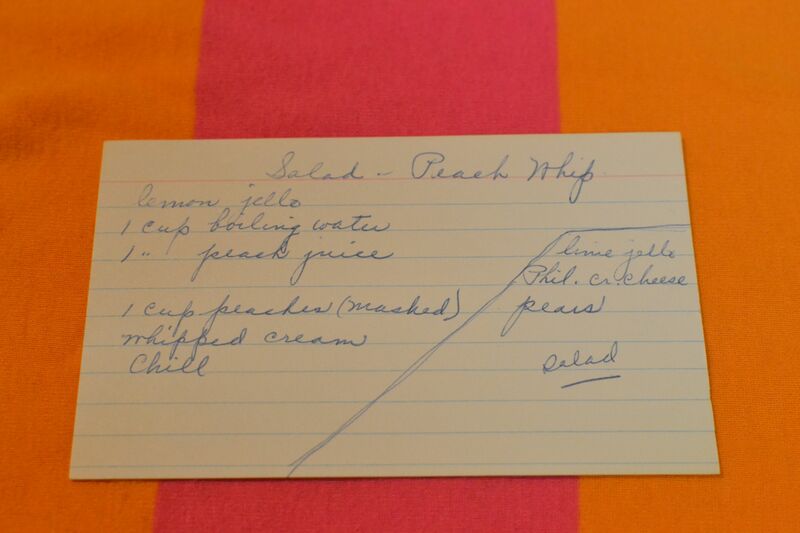 Peach Whip is a jello salad that could be served as a side with a meal or as a summer dessert. The extended family really seemed to enjoy it! I was glad that I had chosen to make it and was really happy it was so simple! I would make it following the same directions as I did for Peach Whip. Boil water and dissolve with lime jello. Add pear juice and mashed pears. Mix in cream cheese. Refrigerate until set. Stir before serving. I hope you enjoy these delicious summer jello salads! They are simple and easy to add to any meal! 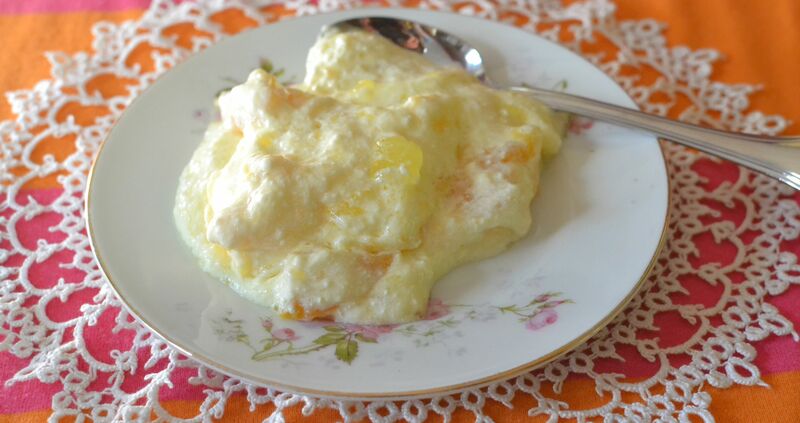 This entry was posted in Jello Salad and tagged fruit salad, grandma's cooking, jello salad, lemon dessert, peach dessert, Summer dessert by GrandmothersRecipeBox. Bookmark the permalink.